I decided to participate in the Design Factor Challenges at Digi Scrap Connect. It is a non-competative 6 week challenge, which should be perfect for helping me practice designing while also adding the pressure of a deadline. I'm one of those people who needs a deadline looming before I can really be creative -- part of why I started working on Creative Teams a year ago. Anyway, the first week's challenge was to create a summer themed mini-kit. My mini quickly turned into a regular sized kit while working this week, but I pared it down closer to mini-sized for the final submission. 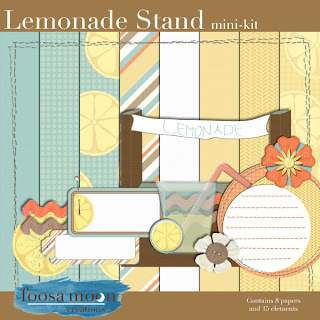 This kit was inspired by my daughter, who was super excited for summer to start so she could set up a lemonade stand with her friends. They held meetings to plan and draw posters, and on the day of the stand they were up early to set up along side a neighbor's garage sale. I used some of my new (and very weak) Illustrator skills to draw some of the elements, and others are scanned and extracted by me. Part of this challenge was that there could be no "CU" items used, so everything had to be from scratch. It was a great challenge, and I had a lot of fun putting this together.